Crash attenuation protects drivers from hazards on and around the road. 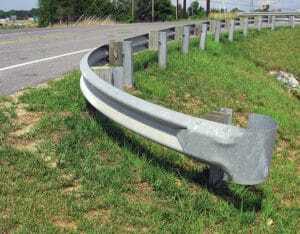 Every road is different: one might need an attenuator, while another needs a guard rail with an end treatment. It takes certain specialties, education, and know-how to put crash attenuators on the streets in the right way and the right setting. We supply, install, repair, and maintain products from some of the industry’s top brands, including Vulcan and QuadGuard. We know what to use in every situation, and we can help you figure out what you need. Re-directive: The vehicle will be redirected into the lane. Non-re-directive: The vehicle won’t be redirected into the lane. Gating: The vehicle won’t go through on impact. Non-gating: The vehicle will go through on impact. All crash attenuation products are tested and approved at certain speeds. 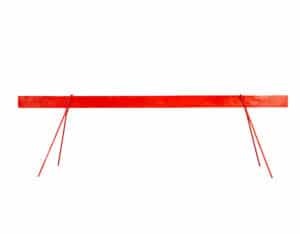 Barricades are solid-looking but light-duty objects that tell people not to pass through them. If a driver hits a barricade, the vehicle will go straight through. Barriers, on the other hand, are heavy duty and crash rated. They redirect traffic to keep workers and pedestrians safe in high-risk situations. If a driver hits a barrier, the vehicle will go off in a different direction. We carry a range of barricade and barrier brands like Vulcan, Glare Screen, Road Runner, and Yodock. 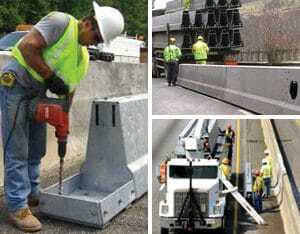 Work zone barriers are used during to keep vehicles from hitting solid objects or road workers. They provide a cushion in a collision. 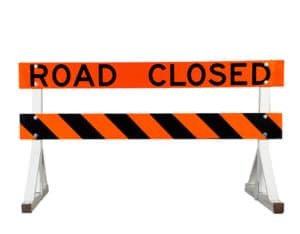 You can use concrete, water-filled, or Vulcan movable barriers to protect your work zone. These are temporary barriers, so they’re only installed for up to six months. 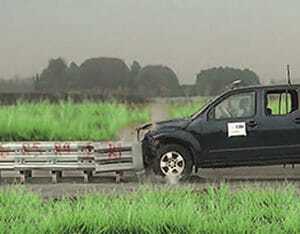 Permanent barriers are installed on shoulders and medians to redirect vehicles in a collision. Most often you’ll see concrete, guard rail, and high-tension cable barriers. Because they’re intended to be permanent, these will last years before needing to be replaced. When the blunt end of a rigid guard rail faces into traffic, it’s only a matter of time before someone hits it head-on. Guard rail end treatments attach to the end of the rail to protect the driver. Different end treatments work in different ways, but they’re all intended to keep the rail in place in a collision. 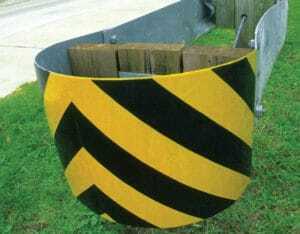 Impact attenuators are placed in front of concrete barriers, guard rails, bridge parapets, toll gates, and other roadside hazards. They’re designed to keep vehicles from passing through, which can save the driver’s life in a head-on collision. As with any other crash attenuation product, each impact attenuator works best in a specific situation. TMAs are mounted behind large trucks or on specially designed trailers to protect vehicles and workers in temporary lane closures. If another drivers hits your vehicle, it won’t be damaged and it won’t crash into your workers. Truck-mounted attenuators work best with heavier vehicles: the truck will roll forward when it’s hit, but the vehicle’s weight will reduce the distance. Trailer-mounted attenuators protect vehicles, which is ideal for contractors who don’t want to tie up a designated lane closure truck.